SynapseIndia job provides you an opportunity to work in a creative and passionate work environment. The organization gives employees the flexibility to come up with new and creative ideas. The work-culture is passionate where you will learn daily new things and ways to solve a problem with a positive approach. If you too are passionate about your work and want to be a part of innovative and creative work-culture, then SynapseIndia is the best place to work. This entry was posted in Uncategorized and tagged jobs in it sector, jobs in noida, software developer jobs, Synapseindia, Synapseindia jobs, work culture in it company on November 2, 2017 by SynapseIndia Careers And Jobs. SynapseIndia jobs opportunity is released for experienced Python Developer. Python is a high-level, interpreted, interactive and object-oriented scripting language. Python is designed to be highly readable. The job location for the profile is NSEZ, Noida. This entry was posted in Uncategorized and tagged jobs for software developer, jobs in noida, python developer jobs in noida, python development jobs, Synapseindia, Synapseindia jobs on June 6, 2017 by SynapseIndia Careers And Jobs. Apply for SynapseIndia Job opportunity for the profile of WordPress Developer. The job location is NSEZ, Noida. WordPress is a web publishing software used to create your own website or blogs. We work on all modern technologies. We also provide quality WordPress Development Services to clients globally. All our projects are thoroughly checked and tested before handing them over. At SynapseIndia, we have no night shifts. We urge employees to come to office on time and go on time. This entry was posted in Uncategorized and tagged Jobs in IT companies, jobs in noida, jobs in WordPress development, software developer jobs, Synapseindia jobs, wordpress developer jobs in noida, Wordpress Jobs on May 2, 2017 by SynapseIndia Careers And Jobs. Take a look at SynapseIndia jobs opportunities for Zend developers. Well established IT company is looking for professionals with expertise in Zend technology. Zend is popular PHP based Framework which has taken PHP web development to next level. At SynapseIndia, our Zend developers bring in-depth expertise & experience in designing, developing, integrating and maintaining applications for mobile and web. SynapseIndia specializes in offering effective & affordable Zend application development services for global clients. We are amongst the most sought after IT employers because of our great work environment & competitive SynapseIndia jobs benefits. This entry was posted in Uncategorized on December 20, 2016 by SynapseIndia Careers And Jobs. Take a look at SynapseIndia jobs opportunities for Android application developers with our like-minded team at Noida office. One of the best mobile app development company in India, SynapseIndia is known for offering unmatched world-class mobile solutions to global clients. We have a team of dedicated Android app developers who address quickly changing technology and business requirements by creating innovative Android applications customized to convene strategic business goals. With us, you get an opportunity to work alongside the best and highly accomplished professionals in IT industry. If you’ve got the talent, and you love the thrill of a company that lives to grow, apply for SynapseIndia jobs. This entry was posted in Uncategorized and tagged android app development jobs, Android Jobs, jobs for android developer, jobs for freshers, Jobs in IT companies, Synapseindia jobs on November 16, 2016 by SynapseIndia Careers And Jobs. 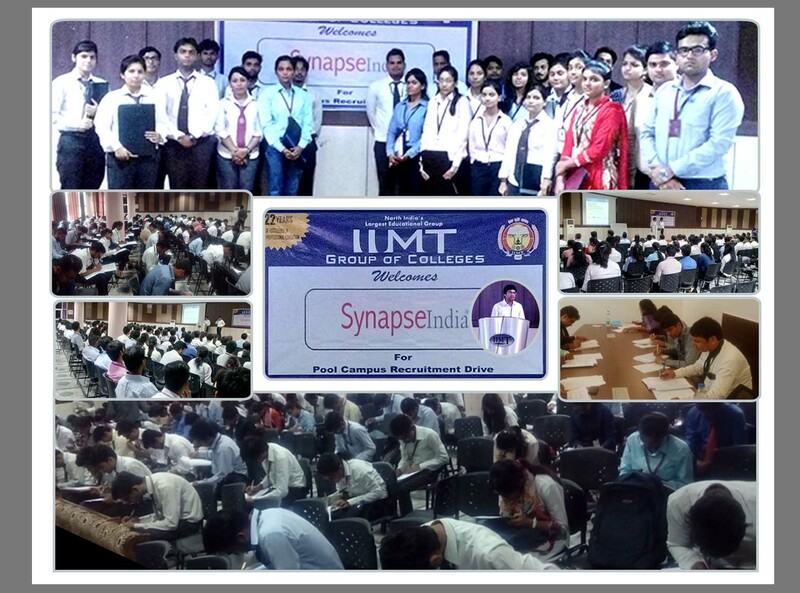 An exclusive campus recruitment Drive by “SynapseIndia” was conducted at IIMT, Greater Noida campus on 30th September 2016. Around 300 students participated from 4 colleges including IIMT greater Noida, IIMT Meerut, IILM, and RKGIT Ghaziabad participated in the campus drive. Most of the final year students pursuing their B.Tech (CS, IT, EE, ECE & ME), M.Tech & MBA appeared to SynapseIndia’s recruitment drive. Students of RKGIT were accompanied by their placement department. Also, IIMT college staff was present during the SynapseIndia campus placement drive. It was great to see all the students in formals and we also found them quite professional & decent. We would like to thank college staff for the excellent arrangements for our recruitment drive. This entry was posted in Uncategorized and tagged Campus Placement drive, campus recruitment, pool campus drive, pool campus placement, recruitment for b.tech freshers, Synapseindia, SynapseIndia recruitment on October 4, 2016 by SynapseIndia Careers And Jobs. Campus placement recruitment Drive by “SynapseIndia” will be conducted in the month of September in Bhubaneswar in which students from various colleges will be appearing. SynapseIndia is an IT company, having number of exciting career opportunities to offer in various technical and non-technical profiles including web development, web design, mobile application development, software development, SEO, Social Media, ORM etc. We are looking forward to hire fresh new talents from various colleges through this recruitment drive. SynapseIndia is headquartered in Noida and has global offices in UK & USA. We are a Microsoft Gold Certified partner, Microsoft small business specialist, Google certified partner and ISO 9001:2008 certified company. This entry was posted in Uncategorized and tagged campus hiring, Campus Placement drive, Campus Recruitment Drive, Recruitment in IT companies for freshers, Synapseindia, SynapseIndia recruitment on September 21, 2016 by SynapseIndia Careers And Jobs. SynapseIndia, pioneer IT solution provider, has openings in different programming, web and mobile application development profiles. SynapseIndia careers offers endless chances to every employee to develop and succeed in their job. On the off chance that you are enthusiastic about writing the codes, Checkout SynapseIndia Jobs on company’s official site and apply online. This entry was posted in Uncategorized and tagged digital marketing jobs, IT jobs, jobs for software engineers, Jobs in IT companies, jobs in noida, Synapseindia, Synapseindia jobs on April 19, 2016 by SynapseIndia Careers And Jobs.